Before you leave your house in the morning, you might be relying on some harsh and even toxic chemicals to help you look good. From shampoos and shaving creams to skin products and makeup, we cannot imagine a day without our personal care products. 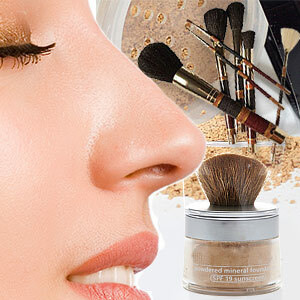 Most cosmetics are a chemical mix of about 200 compounds. These synthetic chemicals are often industrial grade and may not be suitable for regular human use. Some of these synthetic chemicals have even been linked to cancer, infertility and birth defects. About 60% of the topical applicants are absorbed into the body â€“ And this is a major cause of concern. Most often the combination of chemicals is dangerous and deadly over prolonged use. Possible health hazards: May cause dizziness, eye skin irritation, etc. Possible health hazards: May cause tumor, skin irritation, eye irritation and drying/flaking of skin. The chemical and its derivatives may act as a mutagen that may damage the human DNA. BP is also said to generate free radicals. Possible health hazards: Vapor from this chemical may cause dizziness or drowsiness. Prolonged usage may result in dry and broken skin. This ingredient is suspected of causing neurotoxicity. BHA (butylated hydroxyanisole) and BHT (butylated hydroxytoluene): Used in moisturizer and makeup, it is also used as a preservative in lipsticks, moisturizers etc. Coal tar: Used in colorants, to soften skin and to prevent scaling. P-phenylenediamine is a particular coal tar dye used in many hair dyes. Synonyms for coal tar include naphtha, naphtha distillate, benzin B70, or petroleum benzin. DBP (dibutyl phthalate): Used in nail related products to bring in sheen and polish and helps in dissolving other cosmetic ingredients. Used in hair sprays too. Possible health hazards: May cause cancer, asthma, reproductive problems, etc. Diethanolamine (DEA), cocamide DEA, lauramide DEA: Used as a foaming agent in shampoos, baby wash, shaving cream, moisturizers, etc. Possible side effects: Can be absorbed into the skin though the pores and may turn to be carcinogenic. It may also rob the body of essential choline that is required for the fetal brain development. DEA can react with other ingredients in the cosmetic formula to form an extremely potent carcinogen called nitrosodiethanolamine (NDEA). Formaldehyde/formaldehyde releasers: Present as a disinfectant and preservative in nail polish, soap, deodorant, shaving cream and other personal care products. Formaldehyde may not be listed as a separate ingredient but can result from the breakdown of other ingredients like diazolidinyl urea, quaternium compounds etc. Possible health hazards: May cause cancer, eye irritation, genetic damage, immune system damage and asthma. The European Union has banned the use of formaldehyde in any form in cosmetics. Glycol ethers: Widely used in nail polish, deodorants and perfumes. Works as a mutual solvent for many cosmetic ingredients. Lanolin: Though considered safe for use in all kinds of cosmetics, lanolin may be contaminated with carcinogenic organo-phosphate pesticides and other chemicals that were used on the sheep. Allergic reactions such as rash, dizziness, itching and difficulty in breathing are also noticed. Possible health hazards: Being a neurotoxin, lead can cause cCancer, developmental and reproductive toxicity, organ system toxicity, allergies and immunotoxicity, bioaccumulation. Mercury: Compound of mercury to a limit of 65 parts per million is allowed by the FDA. Is used in mascara, skin lighteners and anti-aging treatments that remove age spots, freckles, blemishes and wrinkles. Possible health hazards: May cause skin irritation, neurological damage, allergy as mercury easily passes through the skin. Can damage the kidneys and the nervous system, and interfere with the development of the brain in unborn children and very young children. Possible side effects: These ingredients may be easily absorbed though the skin and may cause allergy and in the long term may cause cancer. Parabens: A group of chemicals widely used to inhibit the growth of microbes in cosmetics, liquid cleansers, Shampoos and conditioners. Possible health hazards: May penetrate the skin and cause endocrine disorder and cause an enhanced risk level of breast cancer. Paraben is also implicated in reproductive toxicity, immunotoxicity, neurotoxicity and skin irritation. The European Union has restricted the use of paraben in cosmetic products. If you can’t avoid Paraben completely when you use a liquid cleaner, wash thoroughly after using the product. Avoid or at least reduce the timeÂ the product stays in contact with your skin. PEG (Plyethylene Glycol): Used in sunscreen, baby care products. Widely used in deodorants, conditioners, moisturizers, etc. it is used as softeners, moisture carriers and solvents. Possible side effects: May cause skin and eye irritation. Can harm the nervous system. Possible health hazards: Extended exposure to this chemical may cause cancer as petroleum distillates are possible carcinogens. They also cause allergy and skin problems. Phthalates: DBP, DMP and DEP are most commonly used in cosmetics. Used in fragrance products, deodorant and nail polish. Possible side effects: May cause altered development of reproductive tissues, liver and kidney lesions, reproductive abnormalities, cell line transformation and may cause cancer. Siloxanes: Widely used in makeup, moisturizer, and hair products, etc. This chemical is used to soften, smoothen and moisten. Extensively used in moisturizers and facial products. Possible health hazards: May interfere with hormonal function, human fertility, etc. May cause cancer and affect the neurotransmitters. Sodium Lauryl Sulfate (SLS) and Sodium Laureth Sulfate (SLES):Used in bubble bath, shampoo, shower gels, cleansers as it produces foam. Possible side effects: May cause breathing difficulties, eye and skin irritation, depression. The residue of this chemical may remain in the body for a period of 5 days within which there is a possibility that it might enter the organs like brain, heart, liver and lungs thus causing damage to these organs over a long run. Possible health hazards: Few of the antibacterial agents may be absorbed through the skin. These chemicals may be carcinogenic or toxic. In a few cases, triclosan traces have been found in breast milk. This chemical may interfere with testosterone functioning. Antibacterial soaps/solutions have the tendency to kill good and protective bacteria along with the harmful ones thus reducing the overall immunity. Toluene: Used in nail polish, hair dye, nail glue, wig glue and hairpiece bonding. Possible side effects: May cause dizziness, skin rashes, eye, nose, throat irritation and headaches. As potential long term effect, it may cause damage to the liver and kidney. It decreases fertility and is associated with reproductive and development damage. Talc: Used in baby products, powder, eye shadow and deodorants. Possible side effects: Used over a long time, it has perhaps the same effect as asbestos. Talc particles have been shown to cause tumors in the ovaries and lungs of cancer victims. In the 10 years since TargetWoman has been established, we have created thousands of pages of information on health – especially under the Athena sub-domain. These pages offer specific health information in easy-to-digest plain English. What makes this stand out from the rest of the crowd is the simple intuitive navigation based on user input. To give you a working example – let us say you start with a query – ‘fatty liver’ Athena will show you a page containing information on fatty liver disease followed by other liver diseases. The links inside will readily take you to specific information on – triglyceride, liver function test, liver cirrhosis, diabetes and metabolic syndrome amongst others. It is easy to drill down to the next stage of information whether you are looking for symptoms, diagnostic tests, drugs or treatment options – they are all there stacked right next to each other. Though this Athena Health section has been on the scene for quite some time, it was not available for hand-held devices until now. A glance at our collated log files didn’t indicate that people with iPads and other tablets had any difficulty viewing our pages. But some complained that viewing our pages in mobiles posed some bit of screen calisthenics which was addressed with the mobile version available here . We went one step further and came up with a dedicated Android App using the same extensive health database compiled over a period of almost 9 years. We keep updating the database at regular rate. Medical information is complex and often littered with medical jargon. This Android application goes deeper into the query to ferret out logical extension of the word you asked. The result is detailed information on a given health topic – arranged in a logical order. At the first glance it may appear as a Wiki on health – it is a lot more complicated than that. Essentially it uses Latent Semantic Analysis to ‘decode’ your requested word(s) and derives the logical extension of the words. It then extracts the best available information from the vast repository of health content. The result is a crisp, purposefully written summary of health content. It is a free App available from Google store. Rice is the staple food for half the world population. On the basis of produce, rice crops produce more food energy and protein supply per hectare than wheat and maize. Though rice has a low protein content when you compare it with other grains, rice is superior in lysine content and meets daily carbohydrate needs. Grown in amazing varieties around the world, each region has its own specialty. From the long-grained Basmati to the sticky black rice, from the medium-grained Aroborio to the mildly fragrant Jasmine rice, you can use rice in interesting healthy ways. We have revised the ebook and added additional features suitable for iBook format in this second edition. Now that we are through with singing paeans about rice, we – at TargetWoman, cooked up a few dozen recipes using rice amongst other things. 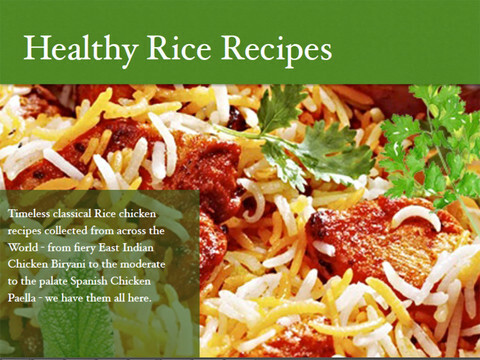 Our primary goal is to come up with a compendium on Healthy Recipes using any available ingredient known to man. We sifted through vast quantities of material and then looked up the implications of the ingredient used. It is a long and arduous task – I can assure you. While that book is still taking shape, we decided to release an ebook on recipes using rice for dinner. We picked the top 12 recipes from around the world – on the basis of simplicity, cuisine representative of a region and our own preferences after trying out so many hundreds of recipes. We hope you will enjoy the recipes as much as we did in preparing them. Bon Appetit ! We offer this ebook at the best price – Free. We would really appreciate if you spread the word around in your social network. As on 17th July 2013, we have updated the Ebook with some changes in the content and visual elements. If you use the link below – you will download the latest revised edition of this book.